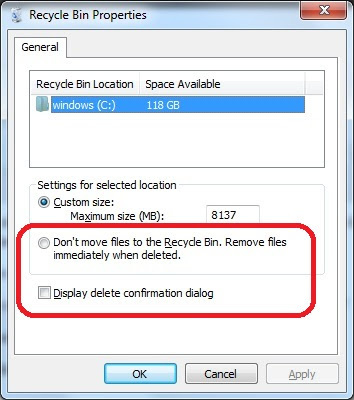 In Windows, when we delete a file, it’s actually moved to recycle bin instead of really being deleted from the disk. This provides a safe backup if we have deleted a file accidentally. This post tries to answer some frequently asked questions about recycle bin. When I delete a file, it’s getting deleted immediately. I don’t see it in Recycle bin. When I delete a file, it does not ask me for confirmation. How do I make Windows to ask for confirmation? These two settings are shown in the below snapshot. Administrators can hide Recycle bin icon from users desktops by configuring the below setting in group policy editor. Navigate to the path ‘ User Configuration -> Administrative templates -> Desktop‘. In the right side pane, look for the setting ‘Remove recycle bin icon from desktop’. Enable this setting. The recycle bin properties are stored in the below registry value. This is a binary value, you should be careful while editing the data. So you told me were the jproperties are stored but how do I read that binary value. So answer the question. It’s nice to know where the recycle bin properties are in the registry, but the binary key gives NO! information on what is coded into it, and you do NOT explain. Without an explanation, your mere statement that the settings are located in a specific place is absolutely useless.